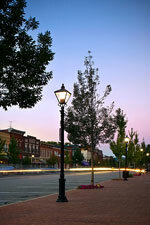 Beaver’s 2002 award-winning streetscape project is noteworthy because some of the beauty created by the project is what you no longer see – the overhead power lines and parking meters. The project was an attempt to replicate the aesthetics of a 19th century Beaver, enhancing the town’s bicentennial celebration in 2002. The centerpiece is a replica forty-foot clock tower on the plaza in the center of the downtown, which has become the iconic symbol of the Beaver community. The clock tower is a faithful replica of the ornate Victorian tower atop the County Court House constructed in 1877, and features a clock with Westminster chimes striking the hour throughout the day. 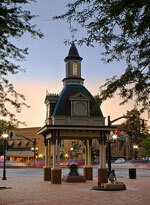 On special occasions, the clock tower system plays seasonal music on the electronic carillon. Adding to the special ambience of the clock tower plaza is the addition in 2007 of statuary of a young boy and water fountain donated by a local family. The $3.5-million streetscape project was funded in part with matching funds of $390,000 raised through private donations and the purchase of commemorative items.